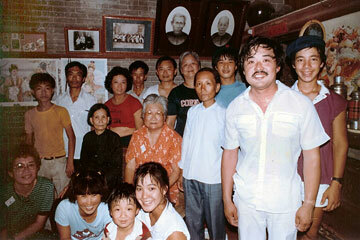 Douglas Chong and his family are shown during a 1982 visit to his great-grandparents' home in China where their portraits still hang (top, center). No one knows the name of the person buried at a secluded hillside shrine in Punaluu marked only by a plain sign: "Punalu'u Chinese Immigrant Memorial, 1895." The first Chinese immigrant to arrive from Nam Long village is believed to have been buried on this site, and generations later, dozens of that villager's descendants make a pilgrimage here annually. "We don't even know if the bones are still there," said Chinese cultural historian and genealogist Douglas Chong, a fifth-generation descendant of Ching Kan You, among the original Chinese rice farmers who settled in Punaluu nearly 130 years ago. "We believe (the bones) were exhumed and sent home to China at a certain point, but our families have, since that time, established the site for worshipping our grand ancestor and we've continued the tradition." The memorial stands on private land, but its owner grants the families access every Ching Ming period, typically in early April, when ancestors' graves are visited to show honor and respect. Ching Ming is not the only time the families gather. Bound together as the Punaluu Yin Sit Sha, members continue to meet annually for a picnic in the summer and anniversary banquet in the fall. The organization, started by seven rice farmers on Nov. 26, 1906, as a debate society for political purposes, celebrated its 100th anniversary last fall and continues to bring together descendants of about 50 original families that once populated the area between Kaaawa and Hauula. The descendants of Ching Kan You alone number about 1,300, spanning nine generations. Although the descendants are scattered throughout Hawaii and the mainland, as well as China, Chong said, "The ritual ties us to the earth, to Punaluu as our roots." 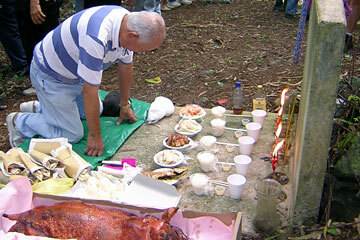 Descendants of Punaluu's rice farmers honor their ancestors every Ching Ming season, at a remote hillside grave. NAM LONG rice farmers from See Dai Doo started settling in Punaluu in the 1880s. Chong estimates that at the turn of the 20th century, about 500 Nam Long people were farming the land in 13 villages on Oahu's northeast coast. "It was the largest Nam Long community outside of China. There were other smaller communities in Hanalei, Hanapepe and Kapaa on Kauai," Chong said. Although the initial farmers came as contract workers for the sugar plantations, they established their own rice farms after fulfilling their contracts, and sent for their friends and relatives. "They worked hard, even the women with bound feet who would be raising vegetables and cooking for their families." Chong grew up hearing his grandmother's stories about life in Punaluu. It's easy to understand Hawaii's appeal to the early farmers. "There was so much strife in China, the Opium War, people were starving, and all of a sudden they came to Hawaii where they were surrounded by beauty and where they could catch as much squid and fish as they wanted, they could raise their own pork and rice was abundant. It was paradise for them," Chong said. Walter Ching recorded his genealogy in a three-ring binder. The photo is of his grandfather Ching Wai Fong. "They lived among Hawaiians and shared a very peaceful coexistence. The first language the Nam Long people learned was Hawaiian. It wasn't until the 1920s that they began to speak English, and when my grandmother was very old, she started speaking Hawaiian again." For the Hawaiians, Chong said, the Chinese came along at the right moment. Due to disease brought by Westerners, the Hawaiians were dying and lacking the manpower to continue tending their fishponds and crops. "Their lo'i were lying fallow when the Chinese came. The Chinese were experts in building fishponds, and they also knew how to grow taro. They restored the ponds and lo'i and helped the Hawaiians." Chong said there was also a culture of sharing. "Everyone raised pigs, so once a week somebody would slaughter a pig. They'd go in cycles, and everyone knew whose turn it was, so they'd go over to that person's house to pick up their share of pork. "It was the same way with fish. My great-grandfather used to tell the family about hiking to the top of a hill when there was a big catch and lighting a bonfire to signal others to come and get fish. They really helped each other." By the early 1900s the Chinese found themselves in a situation similar to that of the Hawaiians. "By 1907, 1908, many of the original farmers were too old to plant rice, and their sons were being sent to Honolulu to be educated. ... And after annexation there were no more Chinese laborers coming in," Chong said. "They ended up petitioning the United States government to allow Chinese to come. "I had heard about it as a kid, but I never realized how strong a movement it was until I went to the National Archives in Washington, D.C., and found a file marked 'Chinese complaint in Hawaii,'" said Chong. 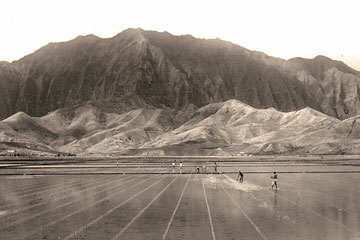 Windward Oahu blanketed by rice fields manned by Chinese families from the mid-1800s through the early 1900s. The discovery was made last October, when he and other descendants were working on a documentary DVD to be presented to the Punaluu Yin Sit Sha during its centennial dinner last November, and images of the documents made it into the work. "These people were not rich, but they were willing to put down a $500 bond on each laborer -- and that was a lot of money back then -- assuring that these guys would be decent, that they would not run away. "They petitioned the government from 1908 to 1917, when their request was finally rejected. By then rice was already petering out. By the early 1920s it was becoming too costly to grow rice. Florida, Texas and California had started to grow rice, and we saw the end of the industry. By the next generation, most of the families had moved to Honolulu." Chong's grandmother moved to Waipahu, and his parents raised him in Palolo. But every year, he goes back to Punaluu to worship at the burial site of the original ancestor. The family brings incense, paper money and a whole roast pig as an offering while enjoying a small celebration on the grounds. "And every year on the anniversary of the Yin Sit Sha, we gather for a banquet to talk about the days of our great-grandfathers. We've also taken trips back to the homeland to visit the graves of our forefathers because many of them returned to China to live out their golden years in their ancestral village. "These days, it's unusual to find these kinds of ties. You may have children, but would you even imagine that four generations from now your great-grandchildren would be mingling not only with their own family, but your neighbors' great-grandchildren?" 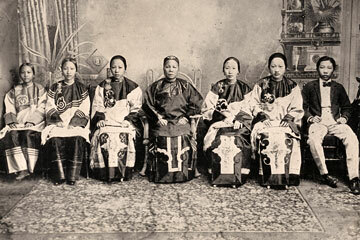 Pictured are members of Ching Kan You's family at the turn of the 20th century. From left are sixth daughter Mrs. Tom You, fifth daughter Mrs. Luke See Chin, third daughter Mrs. Chun Mun Chu, Mrs. Ching Kan You, second daughter Mrs. Tom Chung, fourth daughter Mrs. Yuen Sock and son Mr. Ching Hung Yau. CARLTON CHING said watching the DVD at the Yin Sit Sha banquet was an eye-opener. He's a fourth-generation descendant of Ching Wai Fong, a rice farmer whose son, Yan Quong Ching, went on to open Quong's Punaluu Store in 1935, tying them to the land at a time other families were moving to Honolulu. The store, known today as Ching's at Punaluu, is one of the last tangible reminders of a past world. "My generation -- I'm in my late 40s now -- is at a critical point," Ching said. "My uncles have done a good job of remembering the family history, but we're at a point when information can be lost. I hope that doesn't happen. "I was real surprised when I saw the DVD, because I had no idea there were so many Chinese who set up homes on this side of the island. What I knew was like the tip of the iceberg. By the time I was born, most of the families were gone. They had moved to Honolulu. My father didn't talk too much about it because he was struggling himself, trying to raise all of us." But his father's generation, too, has little memory of rice farming. Carlton's uncle Wah Chan Ching -- the eldest of Yan Quong Ching's 16 children -- was born in 1916 and celebrates his 91st birthday Tuesday. All but one of his siblings are alive today, and they still refer to themselves by their birth rank. Wah Chan was 6 when his grandfather left for China, never to return. "The Chinese Exclusion Act really affected our family. People don't realize what the Chinese went through," he said. "When my grandfather went back to China in 1922, he couldn't return within a year, so he was never able to get back in, even though all his children were born here. He ended up taking a second wife in China, and he died there in 1932." 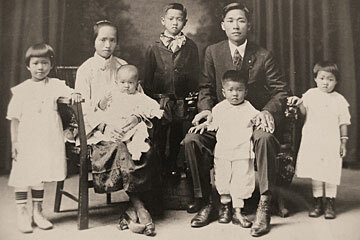 Children in the Yan Quong Ching family in 1922, above, are Evelyn, left, infant Walter (Wah Chu), Wah Chan, Wah Kam and Lillian. Eleven more children were to come. Wah Chan finished his studies at Hauula School in 1930: "In those days we didn't have Kahuku High School, so I lived with my uncle and went to Central/McKinley until I left for college. I was away from my family since I was 14. "I really saw the change from farming. I saw the coming of the highway, electricity." He said there was little difference between the way he lived in Punaluu and the way his uncle lived in town. "Those were the days of the Depression, so nobody had anything." 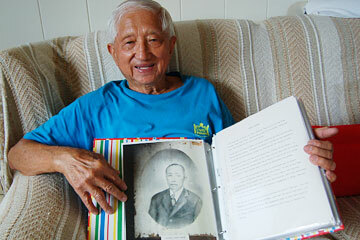 Wah Chan's brother Walter remembers effectively becoming the "eldest" son when his brothers left for school in Honolulu. At age 8, he said, "I would rake the yard, milk the cow, feed the pigs and work at the store." Among the colorful Punaluu characters he remembers was David Makaliu Kaapuwaokamehameha, who gained fame around the world as a postcard figure because of his insistence on living in a grass shack the old Hawaiian way. "He was a taro farmer and fisherman who chose to live as his forefathers rather than drive a truck," Walter said. Kaapuwaokamehameha was sought by tourists, who would receive unequal treatment based on their choice of hotel. "If they were staying at the Royal Hawaiian, which was owned by Matson, he would never let them in. If they were from the Moana, which was not controlled by the Big Five, then he would open his doors, do some poi-pounding, talk story with them. He was really against the Big Five. He thought they were grabbing everything from the Hawaiians." Walter also knew Sammy Amalu, who became a newspaper columnist. In 1972, Amalu reminisced about the Chings' family store, saying, "This was our one source of soda water, of crack seed, of Milk Nickels and Popsicles, and all of those little goodies that never fail to delight the hearts and cramp the bellies of children. "Quong store is still in Punaluu, but now it has become a supermarket. In those days it was just a country store, and I doubt that any of us could have lived without it." 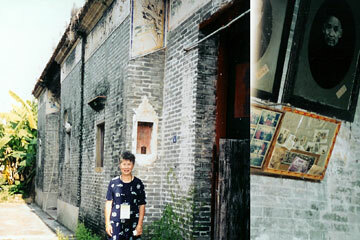 Vivian Loo, granddaughter of rice farmer In Kung Tung, visited her great-grandfather's house in Tso Bu Tao Village, Nam Long, China, in 2001. THE STORE'S history and success in the past is no guarantee of survival. The Chings renovated the property about two years ago and added products such as freshly baked goods, butter mochi and Korean-style chicken to adapt to changing customer tastes. But whether it's enough to carry the family legacy beyond the fifth generation is unknown. "My brothers' kids haven't shown any interest, but hopefully my son might carry on the family business," Carlton Ching said. "He's there every day and he likes it. Only time will tell. "The thing I like about it is, my dad, who's almost 80, still comes down to the family business almost every day, and he likes doing the odd projects. He's building tables now so people can sit down and eat," Ching said. "I kind of look at myself getting older and think one day I want to be able to do the same thing."